Callahan (named for the Spider Robinson books) is a young Chinese Water Dragon. Callahan lives with a human named Gery in Mesa, Arizona. the household also includes a cat named Jabbit. When Gery travels (such as his working trip to Hawaii in Fall 2002), Jabbit and Callahan visit Gery's mother, Gabrielle. Jabbit stays at her house with her cats Laura and Ralph while Callahan takes a job at the Ajo Copper News. 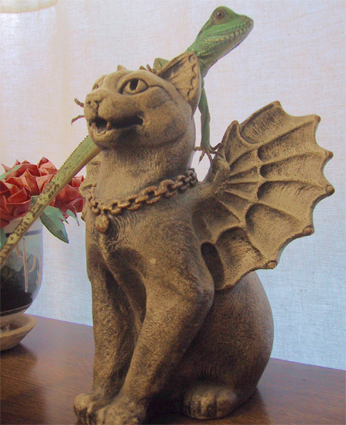 That's where he's shown in this picture, helping a cat gargoyle guard Gabrielle's desk. Callahan will probably double in size and, if male, will grow a crest and jowls. He loves to eat -- primarily mealworms and crickets -- and enjoys a nice shower to relax.